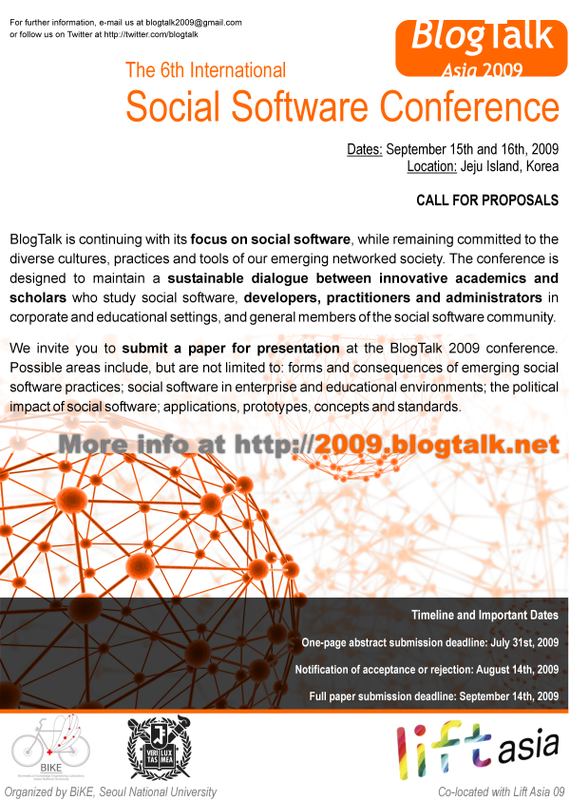 Following the international success of the last five BlogTalk events, the next BlogTalk - to be held in Jeju Island, Korea on September 15th and 16th, 2009 - is continuing with its focus on social software, while remaining committed to the diverse cultures, practices and tools of our emerging networked society. The conference (which this year will be co-located with Lift Asia 09, September 17th and 18th) is designed to maintain a sustainable dialog between developers, innovative academics and scholars who study social software and social media, practitioners and administrators in corporate and educational settings, and other general members of the social software and social media communities. You must submit a one-page abstract of the work you intend to present for review purposes (not to exceed 600 words). Please upload your submission along with some personal information using the EasyChair conference area for BlogTalk 2009. You will receive a confirmation of the arrival of your submission immediately. The submission deadline is July 31st, 2009 (extended).